Do I have to attend a school in San Joaquin County? If you are an online student you must live in San Joaquin County. Can I work in teams? ​All kindergarten – 2nd grade students can work as a whole class. All 3rd-12th grade students can work individually up to a team of 3. WHat are the common reasons why students get disqualified? Is there a project I can not do? There are rules about what types of projects you can do in regards to safety. 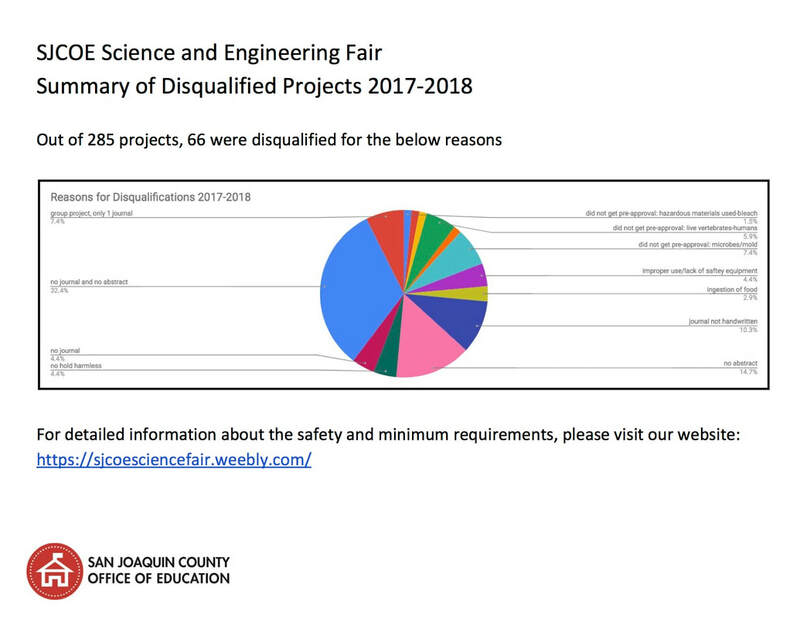 You should check out the requirements for all projects (https://sjcoesciencefair.weebly.com/requirements.html ). One final note, you need to check with your school and see what rules or requirements they might have. How should I dress on fair day? ​We encourage that students dress in a professional manor for interviews. WHERE DO I SEND PROJECTS NEEDING PRE APPROVAL? Can my parents stay with me during the fair? Yes, parents may stay with their students. How do I as a teacher help a student register? As a teacher making sure your school is registered is a great way to help your students get into the fair. HOw long should I expect to be there during the judging? Wha happens when someone wins at county level? Do I have to come to the award ceremony? No. You do not have to attend award ceremony but your teacher will have to make sure your project is picked up.